Works great in multi-level/construction projects. Compact size fits into elevators for easy transport between levels. Dimensions: 5’ 9” tall, 33” wide x 53” long - can easily fit through 36” door. Built with heavy duty casters. We have a wide range of portable toilets, sinks, fresh water delivery systems, holding tanks and mobile showers that can be used for construction sites. 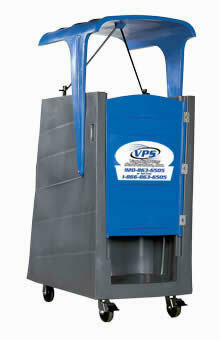 View our sanitation products. All of our sanitation solutions can be rented to construction sites in Oshkosh, Appleton, Green Bay and surrounding cities in North East Wisconsin.